The season opening at the Opera National de Paris set high expectations with the most sought-after ticket of the season and actually unmatchable vocal feast – a starry constellation to die for! Just a glimpse at the cast list would make any opera lover to sacrifice a lot just to be there in October for any of seven performances with Kaufmann, Garanča, Yoncheva, Abdrazakov and Tézier. The hype was obvious by a number of ticket seekers filling metro walkways, stairs and the front of the house. My seat in the middle of the front row on the second balcony provided high viewpoint and excellent sound – a perfect blend of all performers. The audience was met by almost empty stage with a solitary white horse on it, and the staging was relatively consistent throughout the performance – perimeter panelling with intermittently changing props through scenes, either by slide-in rooms (fencing room, convent, king’ s study and prison cell) or freestanding furniture pieces. 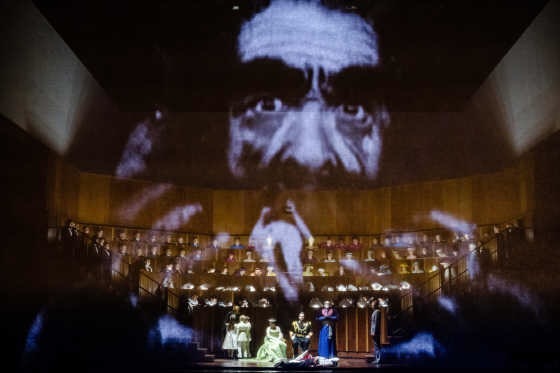 Therefore the story flew without noisy staging interruptions, and was supported by smart lighting and self-explanatory video projections, helping to derive the intent of the concept realised by Krzysztof Warlikowski. Regardless of a period where the story has been transposed, – and we could guess it is mid 20th century, Warlikowski tells us the story happening mostly in the main protagonist’ s mind. Thus the events and facts become insignificant, their perception and interpretation is what creates the drama and draws the line between life and death. Some of the directorial findings are worth high praise, while overall impression from the performance is uneven – there were scenes filled with dramatic tension, while there were others that were actually boring and seemed like singers have been left on their own to figure out what they have to do, – since it was only the second performance in the run, I believe both the cast and the director might figure out how to keep the engagement high throughout. If traditionally there is clear love triangle among Carlos, Elisabeth and Philippe, placing Eboli and her story as a secondary plotline, current production elevates it on a conceptual level and tells us more and in-depth about impossible love. It is Carlos who probably made up the passion for Elisabeth, and created his tragedy of impossible love, and then there is Philippe, who expected that matrimonial vows will give him not only wife and power but also affection. Then we see Eboli who has hopes and desire to throw herself at Carlos, whose heart in turn is not available for her. And then there is Rodrigue, who gives confusing signals of loyalty and affection and has his own personal drama happening deep inside – torn among societal, political and personal motives. 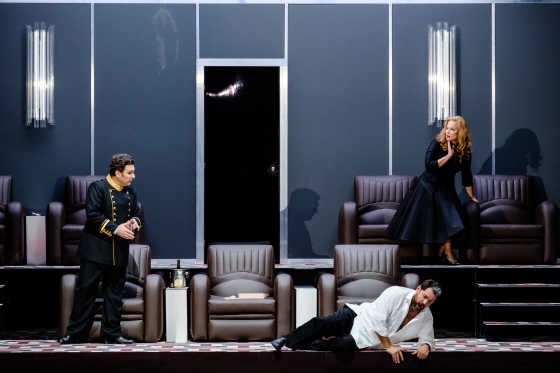 Thus, incidentaly, the most intense stage magnetism occurs when either Eboli or Posa are at the centerstage, – thus Elīna Garanča and Ludovic Tézier overshadowed other lead performers. This is Eboli role debut for Elīna Garanča she has been preparing for, and the role is a great fit for her repertoire. Her voice currently has reached roundness and depth while at the same time there is brightness and thrill in her high register. Elīna Garanča delivered mesmerising Veil song (“Au palais des fées”) dressed in black fencing suit complete with black mask (veil), and climaxed dramatically and vocally in showstopping aria “O don fatal” when the whole audience forgot to breathe and burst into rapturous applause and bravoes. Till the end of the evening, it was more Eboli than Carlos story on the stage. 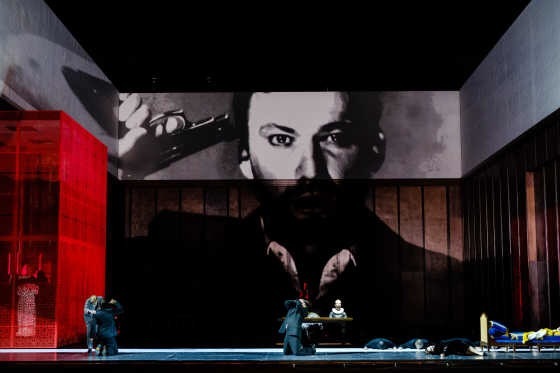 Jonas Kaufmann as Don Carlos delivered great performance, his interpretation of the character again is looking for psychological insight into humanity and deeper motives that define a person. His recent studies of the intrinsic depth of human nature are also transforming his way of vocal interpretation, – there is less heroic forte, much more of mezza voce and melting, heart-stopping piani. It might have been my subjective impression, but seemed like Kaufmann was cautious in the beginning and warmed up later in the performance. There is a lot of new (original) music that is not part of his 10-year tenure of the role he is very comfortable with when sung in Italian. 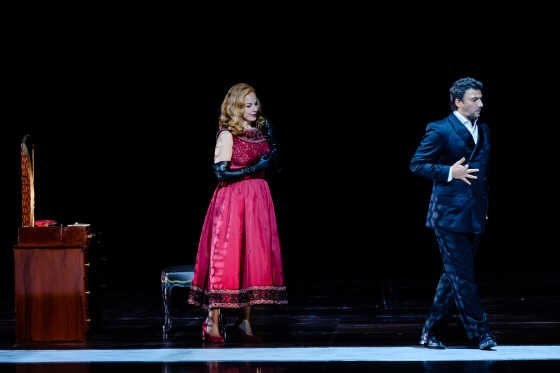 Notably, the Act 1 in the forest of Fontainebleau is a major difference to traditionally performed Italian version, and it provided much more sense to the libretto, and contained great new music, introducing through memory lane the beginning of the love story between Carlos and Elisabeth; also duet between Carlos and the King “Qui me rendra ce mort ?” in Act 4 (removed later), and re-used by Verdi in Lacrimosa of Messa da Requiem. 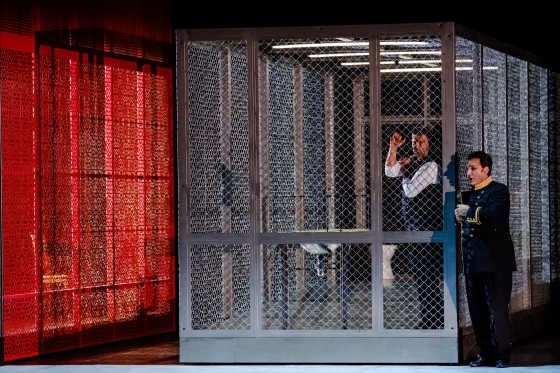 Rodrigue, Marquis of Posa is probably the most controversial character of the opera, impeccably delivered by Ludovic Tézier, who succeeded to bring the complexity of the role to the audience. There were some special shining moments, especially most awaited-for duet between Carlos and Rodrigue “Dieu, tu semas dans nos âmes”. His baritone has well cultured mellifluous tone, and it blends extremely well with Kaufmann’ s burnished sound – the scene to remember at Act 4 with “C’est mon jour suprême”. The flawless performance was rewarded by enthusiastic ovations from the audience both at the performance as well as curtain calls. Philippe II was interpreted by Ildar Abrzakov, his impressive bass portrayed the king as ageing monarch burdened by his extensive power and being highly dependant on dark forces embodied by Grand Inquisitor (Dmitry Belosselskiy). His personal drama influences the whole empire and its unlucky citizens. His predicament is to be eternally vigilant and he will only sleep properly when he is in his tomb in the Escorial (“Elle ne m’aime pas”). Élisabeth de Valois is a tragic and deeply wounded heroine while understanding that her destiny is to bring peace and growth to her people back in France through personal sacrifice. As a royal offspring, she has received proper upbringing, understanding that marriage is about power and duty, not love and desire. Regardless of it all, there was a hope that she might be the lucky one, getting it all. In the interpretation of Warlikowski, we see Élisabeth as a fragile but strong character, and her destiny is in her own hands. Unfortunately, Sonya Yoncheva on her role debut as Élisabeth has not yet fully mastered the depth and complexity of her heroine, thus it came across as work in progress. Her vocal capabilities are well-matching role requirements, she shined brightly in the last act when her crystalline top register was flourishing (aria “Toi qui sus le néant”), and her performance in the duet with Eboli (“J’ai tout compris”) convinced that she will become one of outstanding interprets of the role. The chorus and orchestra under the baton of Philippe Jordan delivered nuanced and wholesome performance, special praise to the chorus for well-balanced sound and providing uniform collective protagonist. Usually one of the most expected moments in the opera for its dramatic and musical impact is Auto-da-fé scene in Act 3. Compared to other scenes, it’ s staging was made spectacular and impressive but somehow lacked the effect – it is hard to tell either if there was too many of elements present (stage props, eye-catching costumes, many performers, a lot of shuffling with the costumes, over-encompassing video projection with terrifying content) that turned my attention away from music and singers, or something else – but the scene is good illustration to the overall impression of the performance – everything in abundance, but the personal chemistry is amiss..
Now, looking forward to repeat viewing from comfortable cinema seat on October 19th, – will you join me to see if the perception changes in the close-up? Previous Post: “Lady Macbeth of Mtsensk” as a time machine in Salzburg. I wish I could have seen this. Of all the versions of Don Carlos (seven, I think) I like the five-act French version best of all.